French President Nicolas Sarkozy called Israeli Prime Minister Benjamin Netanyahu a "liar" in remarks to US President Barack Obama overheard by journalists. 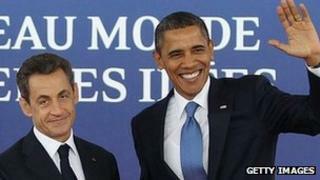 "I can't stand him any more, he's a liar," Mr Sarkozy said in French. "You may be sick of him, but me, I have to deal with him every day," Mr Obama replied. The exchange at the G20 summit was quoted by a French website, Arret sur Images, and confirmed by other media. The remarks - during a private conversation - were overheard by a few journalists last week but were not initially reported, the BBC's Christian Fraser in Paris says. Journalists at the bilateral press conference had been handed translation boxes but had been told not to plug in their headphones until the backroom conversation had finished. But those who did heard the revealing comments. For several days there was media silence in France about the exchange - a decision had been taken not to embarrass the French president, our correspondent says. A correspondent for Le Monde newspaper referred to the conversation without the quotes. But Israeli newspapers have reported it in full. It is said Mr Obama was taking Mr Sarkozy to task for voting in favour of the Palestinian bid for full membership of the UN cultural organisation, Unesco, a bid that was approved despite American opposition. The remarks indicate a breakdown of trust with the Israeli leader which could have wider implications for the Middle East peace process, our correspondent says.